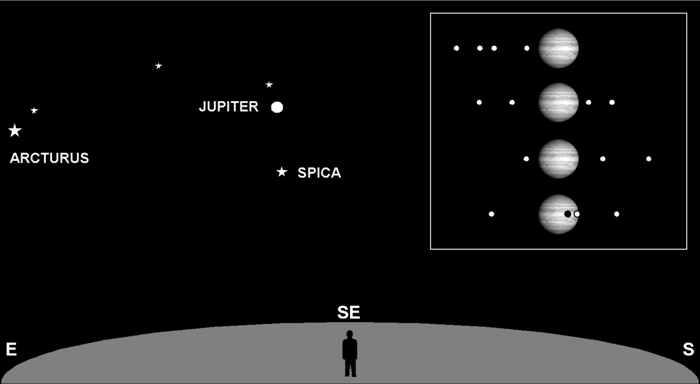 Jupiter, the “king of planets,” is now the brightest object in the southeastern sky. One of its most fascinating features is the quartet of circling moons. They are clearly visible using only binoculars. People with excellent vision can sometimes see them with the naked eye. These are the largest four of some 60 moons cataloged for Jupiter. Their close proximity and linear arrangement around the larger disc of the planet makes them easy to spot. What’s amazing is that you can see them move in mere hours. The insert shows some of the possible configurations for these moons (whose orbits are seen edge-on). What you will see depends on the exact time and date. If only three moons can be seen, the “missing” moon is either behind or in front of the planet — at which time it sometimes casts a visible shadow. Since their motions are well known and predictable, and since Jupiter can be seen from just about anywhere on Earth, the moons provided a means for synchronizing clocks. On ships exploring our oceans in the 15th century, with a clock synchronized to Greenwich, navigators could deduce their longitude decades before the invention of accurate portable mechanical timepieces. Next Next post: Q&A: No Telescope? No Problem.